The sixth stop on the 2015 Northern Home & Cottage Petoskey Area Home Tour is in Petoskey at 816 East Mitchell Street. The story is familiar enough in Petoskey’s leafy old neighborhoods: A time-honored Victorian sits shrouded in bushes for decades, waiting quietly for someone to notice her. The story of this home, built in 1913, ends—begins actually—when Cheyenne and Danielle Smith walked in and knew that they were the perfect fit for the project that would breathe life and glamour back into this once-beautiful home. The Smiths are partners with Danielle’s family, the Howards, in a custom building business. Cheyenne and his brother-in-law, Josh Howard, had the skill, vision and resources to perform this Architectural Digest-caliber renovation. Rewind to the day the Smiths first saw the place: shag carpet, layers of wallpaper (including a particularly funky red velvet pattern! ), cramped, cut-off kitchen, dining room window completely blocked off by a plate glass mirror, aluminum-clad siding … Fortunately, the Smiths and the Howards looked right through all of that to the original leaded windows, the pocket doors, the deep crown molding, and the carved-mahogany front door covered in Murphy-green paint. And then they rolled up their sleeves. This stunning renovation preserves all that was classic about the house—including the leaded windows and a complete re-creation of every inch of that molding—while infusing the home with a shot of glam it hasn’t seen since the Roaring Twenties. 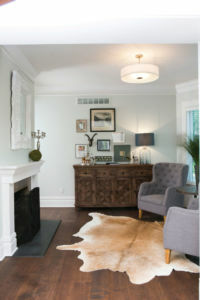 Tourgoers will move across a new maple floor with a hand-rubbed European finish to the parlor, with its walls painted a pale shade of sea-foam green, original fireplace and refurbished mantel. The newly opened-up dining room and kitchen—designed by Jill Brecheisen of Kitchens by Design—dazzles just beyond with its marble counters, glossy white cabinetry, subway tiles and maple island countertop that matches the floor. Note the small, stylish open shelves made from reclaimed wood, courtesy of a new Petoskey-based business, True Barn Lumber. More elegance awaits up the spiral staircase—but we don’t want to give away the whole story! Northern Michigan Wineries, Breweries, Petoskey restaurants, things to do around Petoskey and more! Our MyNorth Vacation Guide can help you plan your entire Northern Home & Cottage Home Tour Weekend!